Who would benefit from simultaneous title run-in kick offs? Arsene Wenger cast doubts over the mental toughness of his Arsenal side this week with suggesting that the final three rounds of Premier League matches should kick off simultaneously. It’s an unheard of suggestion that will almost certainly be ignored by the Premier League and more importantly the television companies, who wouldn’t stand to benefit from such a scenario. There are advantages and disadvantages to kicking off later than the other teams. If you kick off later than your rivals, and they have lost, then you are in a more comfortable situation. Psychologically it can give you a lift, and it’s true that it can apply for us or Manchester United or Chelsea, but I think it would be better not to give any team this advantage. Intuitively one would think such a change would benefit Wenger’s Arsenal; the Gunners are perceived to be mentally weak and liable to crumble in tight title races. By kicking off at the same time as their rivals, their players would not be subjected to the pressure of either having to ‘set the pace’ for the weekend, or respond to their rivals’ results. Rounds involving matches between the three teams. The rationale for this is the third team knows in advance that points will be dropped, and are therefore not reacting to an unexpected result or dropped points. Rounds where at least one team did not play, owing to postponements/cup commitments etc. The rationale for this is to avoid an uneven number of matches analysed for each team, maintaining an even comparison. Rounds where all three teams kick off at the same time, for obvious reasons. The three teams can either ‘set the pace’ for the round, that is playing first and having at least one team play after them (two teams may set the pace simultaneously), or ‘respond’, that is not playing first in the round and playing after at least one team (up to two teams can respond, simultaneously or otherwise). For example, on matchday 18 of the 2009/10 season, Man United ‘set the pace’ with a 3-0 loss to Fulham on Saturday at 3pm. Arsenal and Chelsea were therefore both responders, who beat Hull and drew with West Ham in the late Saturday and late Sunday kick offs respectively. On matchday 15, however, Arsenal and Man United both kicked off and won at 3pm on Saturday; thus they were both pace setters and only Chelsea responders, who lost 2-1 to Man City in the late kick off. Summarising the results from the teams as either pace setters or responders, we see which they prefer. We should bear in mind that teams typically ‘respond’ in televised late Saturday or Sunday kick offs (unless the team setting the pace played an early Saturday kick off, in which case teams may respond at 3pm on the same day), which may mean to an extent that these games are tougher; television companies are more likely to choose so-called bigger matches for these kick off times. However, this applies to all three teams, which makes Man United’s record as responders very impressive. The results show that they are marginally better playing after Chelsea and/or Arsenal, collecting 77% of possible points compared to 74% when playing first. Meanwhile, their rivals have shown a tendency to trip up when playing second or third. Collecting only 56% of possible points when playing after Man United and/or Chelsea confirms the concerns over Arsenal’s ability under pressure; they much prefer playing first in any given round of matches. Chelsea are easily the best pace-setters out of the three, picking up an impressive 44 out of a possible 54 points in the 18 rounds where they played first. At first glance, Wenger’s suggestion would certainly favour Arsenal along with Chelsea, whilst Sir Alex might prefer to keep the schedule as it is, particularly if their rivals are forced to chase them. However, it’s worth looking at how teams respond to particular results, rather than all results as presented in the table above. We look at how good teams are capitalising on results as responders, that is winning when their rivals have dropped points before them, and how likely they are to stumble as responders, that is dropping points when their rivals have won before them. The table below shows how good each team is in these respects. Teams are always capitalising on or stumbling after the best result to have taken place before their match. If we look back on matchday 18 (in order: Fulham 3-0 Man United, Hull 1-2 Arsenal, West Ham 1-1 Chelsea), the best result before Arsenal’s match with Hull was Man United’s loss to Fulham, whereas the best result before Chelsea’s match with West Ham was Arsenal’s win over Hull. Thus, Arsenal have ‘capitalised’; winning after their rival has dropped points, whereas Chelsea have ‘stumbled’; drawing after one of their rivals has won. So to interpret, in the 10 matches where the best result before Arsenal played was a draw or loss for one of its rivals, the Gunners have won, or ‘capitalised’ 8 times, giving a percentage of 80%. Meanwhile, in the 24 matches where the best result before Chelsea played was a win for one of its rivals, Chelsea lost or drew, or ‘stumbled’ 12 times, giving a percentage of 50%.They can also be read as conditional probabilities; the probability Manchester United will win given the best result from Chelsea or Arsenal before them is a loss or draw is 0.43. Remarkably, Arsenal are the best at taking advantage of their rivals dropping points, failing to win on only two occasions. Chelsea are the next best, whilst Manchester United have a strange tendency not to capitalise on their rivals dropping points earlier in the weekend. United’s real strength lies, however, in not tripping up whilst they are under pressure; on the 19 occasions Arsenal and/or Chelsea won before them, only 3 times did they fail to also win. Sir Alex Ferguson’s famous motivational team talks must play a role here, easing the pressure on his players and making them focus on their own performance, rather than the good results of others. Chelsea and Arsenal are nowhere near this good in similar situations, winning only 50% of the time. Are Arsenal and Chelsea’s strong capitalisation rates but poor stumble rates a reflection of their response to pressure? It certainly seems that way; Ancelotti and Wenger appear to have both failed when it comes to relaxing players after their rivals have won earlier in the day or weekend. There are advantages and disadvantages to kicking off later than the other teams. If you kick off later than your rivals, and they have lost, then you are in a more comfortable situation. What’s odd is that Wenger doesn’t even know his own strength; the exact situation he refers to is the situation where Arsenal excel! Perhaps the comment comes from the fact that he sees his own team feel more comfortable after United and Chelsea have dropped points before them. Either way, it’s curious he does not mention the reverse situation, where a team kicks off later than their victorious rivals. This is the scenario he perhaps most fears, and justifiably so, given the remaining games this season. The table below summarises matches already arranged by the Premier League and television companies. * This is an unusual week owing to cup fixtures and postponements, and this round would be excluded from analysed results as only two of the three teams play. ** Although this is not a scheduled round of matches, the natural form of setting the pace and responding remains. ** This weekend would be excluded from the analysed results since it is a round featuring a match between the big sides. As I write, no further games have been rearranged for television. In the four ‘normal’ rounds of matches, Arsenal are always responders; this must be a concern for Arsene Wenger. If Manchester United or Chelsea win earlier in the round, their history of stumbling does not favour them, so they must hope to capitalise on their rivals dropping points, something they have shown to be good at. If United win on the four occasions they set the pace, they should be aware that both Chelsea and Arsenal have a good chance of stumbling, and consequently could pull clear for a 19th title. No doubt Ferguson will remind reporters of the pressure United victories put on Chelsea and Arsenal. The last two seasons show that Arsene Wenger has every right to be concerned about his team kicking off later than Chelsea or Man United. Whilst they are good at taking advantage of their rivals’ slip ups, they have a tendency to trip up themselves under pressure after a rival victory. The same could be said for Chelsea, and they won’t be relishing the prospect of having to respond on numerous occasions for the rest of the season. Simultaneous kick offs for the final three matches will never happen, but analysis of varied kick off times reveals much about the psychology of football. Let me know what you think about this by commenting below. Would you support simultaneous kick-offs for the final three matches? 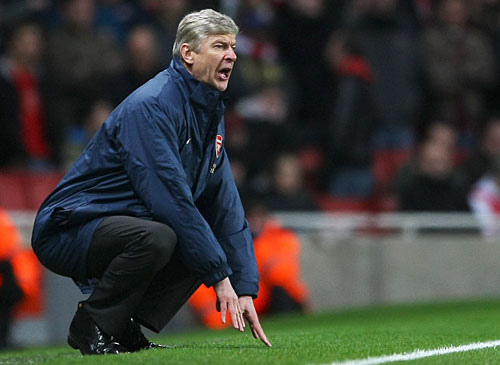 What makes Chelsea and Arsenal so much more likely than Man United to stumble under pressure? The most recent Premier League weekend provided further evidence of both Arsenal and Chelsea’s problems with ‘stumbling’. Had United lost or drawn at West Ham, both sides were likely to ‘capitalise’, or win. The moment United came back for victory, the odds of Arsenal or Chelsea winning slumped to only 50%. The manner of United’s win could not have helped either. Arsene Wenger has expressed his displeasure about having to play numerous games on Sunday – from the evidence it’s clear why he’s not happy. It could make the difference in the title run-in. Note: Zach Slaton, author of the excellent A Beautiful Numbers Game blog, offered some advice on checking whether match difficulty and location (home/away) affected the numbers. I’m hoping to learn some of the skills to do this through my degree, and whilst I acknowledge these factors to be important, please enjoy the post as it is for the time being! ← Can Scott Parker be England’s holding midfielder? Excellent bit of research and analysis. As per Wenger’s suggestion of the final 3 rounds, it seems totally arbitrary. Why not make it the final 5? or 10? or 38? For anyone aspiring to win trophies, pressure is a constant and in the interests of helping his players relax and play the football they do, Wenger chooses to ignore it. Maybe if the players were reminded that although it was early in the season, dropped points at home to west brom and Newcastle would cost them in may, the urgency may have got a better result. Thank you. To be fair to Wenger, I think he said 3 rounds because the final 3 rounds of Premier League matches have not yet been rescheduled for television, so as it stands at the moment they are all simultaneous even if they will not remain that way. But your point still stands – he’s not suggesting it just for this season, he’s suggesting it as a Premier League rule, which makes the cut off date purely arbitrary, as you say. Not sure whether me commenting this will be worth anyone’s while given I’m a Spurs fan and despise Wenger & Arsenal so I’ll keep it short. This man is literally willing to say absolutely everything in order to avoid criticising himself or his players. He has reached new levels of delusion this season saying 1. There should be a rule making long throws illegal, and 2. this. It’s part of playing football, no matter what level you play at, you play when you are told to. Pathetic from him, again. Top research mate. Was a very interesting read! Excellent analysis. Truly brings the strengths and weaknesses of each team and its managers into focus. It will be interesting to see the results of the remaining rounds and see if this is a good prediction tool for the title race. Is there any possibility of a follow up feature following the end of the title race?